Most prescription safety glasses purchased online are for impact safety, and for good reason. There are plenty of other types of prescription safety glasses, from those for laser safety to those for glassblowing or welding, but far and away ANSI Z87-approved prescription impact safety glasses are the most common. ANSI, or the American National Standards Institute, is responsible for creating the majority of safety standards enforced by OSHA, the Occupational Safety and Health Administration. ANSI decides what makes your protective equipment safe, and OSHA makes sure that you wear it when you’re supposed to. And while many foreman and skilled workers fear visits from OSHA, the truth is that the standards they enforce are important, and a lot more people would get hurt if they weren’t around. Far and away, polycarbonate is the most impact-resistant lens material. 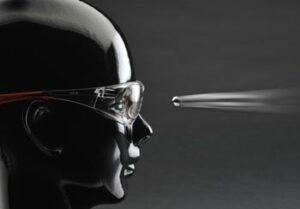 Whether you’re getting a pair of prescription safety glasses for construction, woodworking, riding a motorcycle, or any other potentially dangerous activity, polycarbonate is the best lens material choice for protecting your eyes from impact and projectiles. High-impact safety glasses, particularly, almost never use a lens material other than polycarbonate. Z87 is ANSI’s standard for safety glasses. It has had several revisions through the years, and a few are in use right now. The basic impact standards required by most job sites fall under the standard impact safety rating, which means that prescription safety lenses need to be at least 2mm thick at their thinnest point. Basic side coverage is also required, which can be satisfied with side shields or a wraparound style frame. Technically, if you are required to wear ANSI Z87 approved safety glasses, you are not supposed to have any color to your lenses (tints, polarization, or Transitions), but this commonly not enforced, especially outdoors. Prescription safety glasses should be comfortable, which is why the new wraparound style frames are both more comfortable and better-looking than the older, flatter styles. The reason for this is simple: if you like the way your glasses look and feel, you’re less likely to take them off. A common mistake is when someone takes off his or her safety glasses for a moment because of discomfort caused by the glasses. Bad timing is when OSHA shows up while your glasses are off, and worse timing is when an object flies toward your face. The frames are designed so you don’t want to take them off, so you never get caught with your glasses down. ANSI Z87-approved prescription safety glasses must have the proper printing on them to be accepted by OSHA. They should have Z87 printed on the inside of both temples as well as on the inside of the frame front, and they should have the initials of the lab that produced them stamped into the corner of each lens. If there are any other parts which could be removed (such as side shields), they should also have Z87 marked on them. Accessory parts that do not directly aid in impact safety do not have to have this printing, such as foam gaskets and straps or lanyards. Don’t get caught with your glasses down. If you need prescription safety glasses, invest in a quality pair that will be comfortable and will last a long time. Our glasses in the “Prescription Safety Glasses” section have our full support for comfort and durability, and our most popular brand of wraparound safety glasses is the Wiley X series. If you are unsure of whether a product will fit you comfortably, or if you don’t know what’s best for your face size and shape, give us a call and we’ll be happy to guide you to a pair that will work for you. Many of our customers will order a few frames without lenses to try them on before investing in prescription lenses, as our frames are fully refundable as long as they’re returned within 30 days. We hope you have fun browsing our catalog and exploring the variety of stylish prescription safety glasses for impact safety that we offer, and thanks for reading. Have prescription safety glasses kept your eyes safe from impact damage? Tell us about it in the comments below!